Sea monsters can be very deceiving, even when dead. 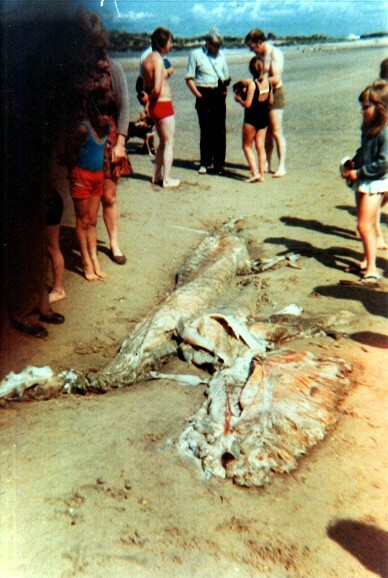 For example, it is well known, especially in cryptozoological circles, that the decomposing carcase of a beached basking shark Cetorhinus maximus often transforms very dramatically, and deceptively, to yield what on first sight looks remarkably like a long-necked, four-flippered, slender-tailed, hairy plesiosaur-like creature. This is the so-called pseudo-plesiosaur effect, in which the jaw and sizeable gill apparatus fall away, revealing a lengthy portion of vertebral column that superficially resembles an elongate neck, coupled with the shark’s dried-out pectoral and pelvic fins looking like flippers, its lower tail fin dropping off, and its skin’s exposed collagenous connective fibres gaining the appearance of thick fur. Similarly, when a sperm whale Physeter macrocephalus dies at sea and its carcase gradually rots, its heavy skull and skeleton eventually sink down to the ocean floor, but sometimes a very sizeable skin-sac of rotting blubber, surfaced externally with exposed connective tissue fibres, will remain afloat – encasing a thick matrix of collagen and often not only the substantial spermaceti organ too but also a few isolated ribs with fibrous flesh still attached. If subsequently washed ashore, becoming what is popularly dubbed a globster, this hairy, bulky gelatinous mass, with the ribs protruding like tentacles, is sometimes mistaken for the mortal remains of a gargantuan octopus – an extraordinary metamorphosis just as radical as the pseudo-plesiosaur effect, and one, therefore, that a few years ago I christened the quasi-octopus effect. Obviously, however, as a pseudo-plesiosaur only arises with decomposing sharks whereas a quasi-octopus only arises with decomposing whales, there is no mechanism by which both of these artefacts – these charlatan sea monsters – could result from the same carcase. Or at least that is what I had always assumed – until the following case (not previously published online) was brought to my attention. 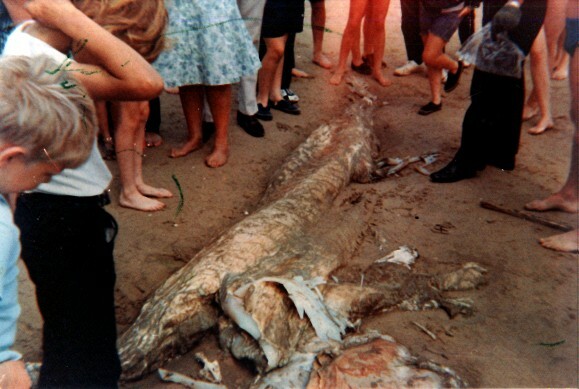 It was on 6 February 1996 that Roger C. Reeves from Brisbane in Queensland, Australia, wrote a short letter to me informing me of what he referred to as a mysterious rotting sea creature that had been seen – and photographed – lying on a beach in Kent, England, in 1976 by his secretary, Mrs Juliet Lilienthal, who lived there at that time. Mr Reeves kindly provided me with his secretary’s current address, and after writing to her I received four excellent close-up photos of the carcase, three of which are reproduced here (the fourth was merely a paler duplicate of Photo #1). Combined with the above description, the photos depict a classic pseudo-plesiosaur, from the cartilaginous (gristle) skull or chondrocranium possessed by sharks, and the long neck created by the jaw and gill apparatus falling away, to the flippers, and the long crocodile-like tail, resulting from the breaking off during decomposition of the lower fin, leaving behind only the upper fin (into which a shark’s backbone runs). The scales were the rough, tooth-like dermal denticles borne in the skin of sharks, and the neck ‘feathers’ were strands of exposed connective tissue, as were the ‘elephant hair’ at the tail base. So far, so good. As can be clearly seen in Photos #1 and #2, however, also present was what looked for all the world like a mini-globster, lying on the beach a little way apart from the rest of the carcase (i.e. the pseudo-plesiosaur portion), and possibly placed there specifically by one or more of the various interested onlookers (of which there were many, judging from the photos), but still physically linked to it by tissue. In her note, Mrs Lilienthal presumed that this peculiar object was the creature’s lungs, but as the creature was a shark it obviously did not possess lungs, respiring via gills instead. So just what was the mini-globster? As it was part of the shark carcase, it was evidently not a true globster, i.e. a quasi-octopus, composed of whale blubber and collagen. Instead, it was undoubtedly an organ of some kind, but in view of its very large size in relation to the main, pseudo-plesiosaur portion of the carcase it was no ordinary one. Looking at Photos 2# and 3#, the mini-globster appeared to be connected to the pseudo-plesiosaur portion via a series of white, bony-looking arches, which I assumed were the gill arches component of the gill apparatus. As for the mini-globster itself, the only organ in sharks that attains such a size is the liver. In some species, this massive bilobate, oil-storing mass can account for as much as 25 per cent of the shark’s total body weight, and can occupy up to 90 per cent of the total space present within its body cavity! 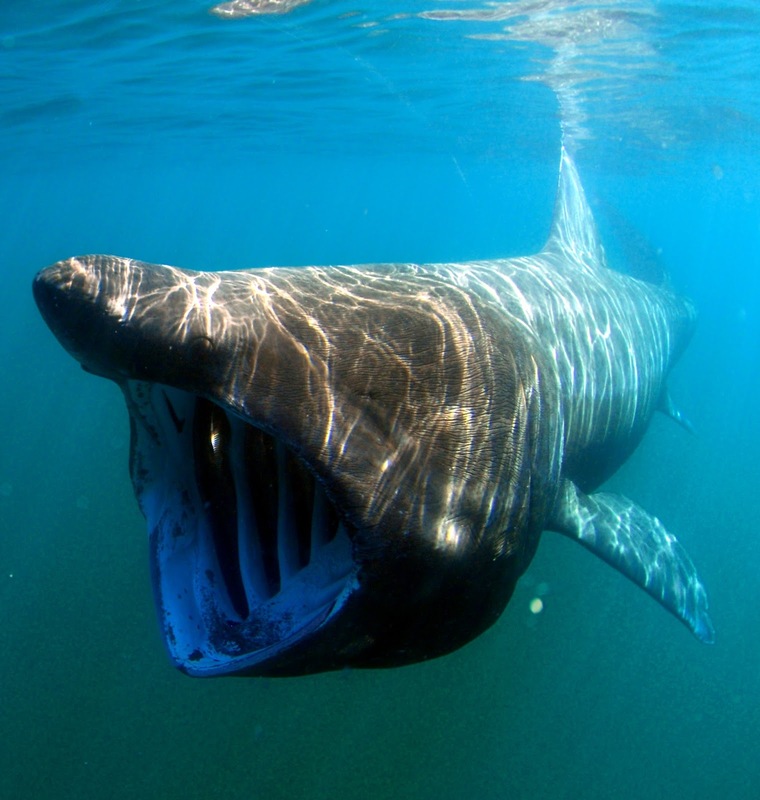 Moreover, with regard to the basking shark, the liver is so substantial that in a 2072-lb (940-kg) individual, it can yield as much as 549 gallons (2270 litres) of shark liver oil! Keen to receive some independent opinions, however, I showed the photos to two colleagues who share my interest in ‘sea monster’ carcases. One was German cryptozoological researcher Markus Hemmler, with whom in September 2010 I had already successfully uncovered the identity of a uniquely perplexing sea monster – the enigmatic Trunko (click here, here, here, and here). The other was British palaeontologist Dr Darren Naish, who has surveyed a number of classic sea monster corpses online in his Tetrapod Zoology blog (click here); as, indeed, has Markus in his own Kryptozoologie-Online blog (click here). What were their views? Markus agreed that the white arches were probably the gill arches, and he prepared a version of Photo #3 in which he ringed these in red (Photo #3a). As for the mini-globster itself, he wondered whether this may constitute some remains from the shark’s pectoral girdle. Conversely, noting that the mini-globster seemed to lack any vertical bars, which should still be present if it was part of the gill apparatus, and also that it looked much too solid in form to be the latter, Darren leaned towards it being the liver, confirming that the liver of sharks is indeed huge, extending for much of the body’s length. Moreover, the texture of the mini-globster is somewhat liverish in appearance. Although I wrote back to Mrs Lilienthal requesting any further information that she could offer me, particularly in relation to the precise location in Kent where the carcase had turned up, I didn’t receive any further response from her, and I have no knowledge of whether any samples were taken from it for scientific analysis. Even so, the photos (which are among the best that I have seen of a supposed sea monster carcase) and her written description are sufficiently informative for me to state with an unexpected degree of confidence when dealing with such notoriously ambiguous specimens as sea monster carcases that the Kent ‘two for the price of one’ carcase from 1976 was assuredly a highly decomposed shark, probably a basking shark in view of its large size (using the onlookers surrounding it as a scale), with the mini-globster most probably either a portion of its gill apparatus or (the identity I personally favour) the shark’s liver. 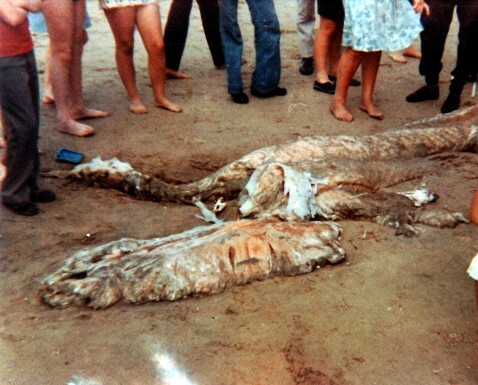 If any ShukerNature readers happened to be among those onlookers who in 1976 viewed the Kent sea monster carcase documented here, and could provide additional information concerning it, I would love to receive your comments and information here! I wish to offer my sincere thanks to Robert C. Reeves and Juliet Lilienthal for bringing this very noteworthy case to my attention via their letters and photographs, and to Markus Hemmler and Dr Darren Naish for their much-valued opinions concerning it. A living, pre-pseudo-plesiosaur basking shark!